I started writing books at the age of twelve. I don't know why. Here is a list of the books I have written, and some thoughts on those I intend to write. I think there is an indication here of what time it takes to learn how to write; the first five books are unpublishable, the last five all could see the light. A little luck doesn't hurt. To be truthful, I have always viewed writing as a life-long endeavor, where the last books should be the best. The last thing a novice writer should expect is to sit down, crank out a book, and expect it to be published. Get in it for the long haul. Please yourself. I'd write books for the rest of my life even if none were to be published. Life is short. At the risk of sounding trite, or worse old-fashioned: Don't follow your dreams. Lead them. My first book at age 12, and I still have it. About myself and three childhood friends and our juvenile delinquency. The best thing about it now is the insight into the twelve-year-old mind it provides. Best memory was when my friend Dave Early, one of the characters, lent the manuscript to Denis Cocchiara's older brother. I remember walking into the men's room in Norwood Junior High School, and standing next to Cocchiara's older brother at the urinals. He looked down at me - he was this great, big eighth-grader and I was this little, shy seventh-grader - he looked down at me and said, "Hey - are you the one who wrote that book?" I looked up and squeeked, "Yes." Older brother Cocchiara leaned over and down at me. "I read it," he said, "and it SUCKED." And thus I had received my first review. An example of great twelve-year-old prose: "Soon we all started smoking. In about a year Dave and Frankie couldn't go without "smokes." Brad and I smoked occasionally - about three times a week. The Beatles suddenly started playing records and it started a new era. We all could get girl-friends easy. So a couple times a week we all went down town with a couple of broads, smoked, and really 'hit' the town." First attempt to write a book as an adult, made it through 173 pages before giving up in disgust. Absurd novel. I once had a framed map of Canada hanging on my office wall, and one day I noticed a tiny spider living under the glass, over Vancouver Island. So I decided to write a novel about a guy who finds a spider living under the glass of his map of Canada, only he notices that whenever it rains outside the spider is over the water, whenever it's cold he's over the mountains, etc. And this guy tries to sell the weather-reporting spider, but ends up in a lodge with characters such as Mountain Dew, The Olde Manse, and Edgar Allen Pot...some pretty funny stuff pretty poorly written. First lines of the novel: "I don't suppose many stories have happy endings, at least true ones don't. But that doesn't matter, because this story isn't true..."
Pretty good book pretty poorly written. A pivotal book for me, even though it was never published. Great plot, based on a poem I wrote in 1976 (see "Trawlerman" in the Travelogues section) about a fisherman who asks his best friend to help him "disappear" at sea to leave his wife, then later decides to return. Sent out agent queries and Lee Matthias, who was then handling a newcomer named Loren D. Estleman, took on the book. "...we certainly appreciate the amount of effort that has obviously gone into it, but unfortunately, it's not strong enough to warrant representation. Like many authors, you need to learn certain writing skills that can only be acquired with practice and perseverence...although we liked the first few chapters of this, we ran into trouble areas with the body of the manuscript. Juan did not make an appealing character because of the tone of your narration, which was quite drab and moved quite slowly..."
...which was quite drab and moved quite slowly... Thank God I have a good sense of humor. For months my wife Terry would look over my shoulder and ask, "...so how's this going, is it also quite drab and move quite slowly?" "Here's Faded and Changed. There's so much good stuff in it, I can see why your ex-agent was enthusiastic. It's not ready for publication yet, but when you feel that you want to renovate it I know you'll make it into another good one. As it stands, the book lacks a central focus; deciding who is the central character may relate to deciding what kind of book this is. Is it primarily a thriller, the characters of which, though interesting for their own sake to a degree, exist mainly to further the plot? Or is it a literary novel in which the thriller plot is the armature around which you build the other features of the book? "...If you're aiming towards popular fiction, the characters' inner lives may be overdeveloped, while their external individuating features (personal appearance, habits of speech, place on the good-bad spectrum) may need playing up...Faded and Changed has a thematic motif similar to that of DC7: The Quest. If F&C is a thriller, the questers will kow what they're looking for -- the Right. They may not recognize it when they see it, they may not know what they're doing, but in the end Good will triumph over Evil, the Good will be rewarded and the Wicked punished, and Order will arise from Disorder. "The idea that a poet could be corrupted by promising him a fat publication contract is brilliant, and so is the creation of his habitat. In addition ot Juan's beach, the rest of the town scene is wonderful. I kept seeing coastal towns with perhaps a cotton mill or shoe factory upstream alongside the (former) falls; lots of people marginally employed at tough, uncertain jobs; working-class people who used to make it but who are now poor; those with money not counting on keeping it. You're seeing Mass., I'm seeing Maine, but it doesn't matter; your towns are wonderfully evocative. The cabin in the woods and Dee's real saviours -- that part works very well indeed, and it's also very funny. "You seem to like the technique of telling the whole plot, then telling it again with more detail, then telling it again with still more detail. Because the plot runs along thriller lines, I think you need to save a twist for the end, but that twist can't be the fact that drives the whole saga...when an author kills his characters off at the end, the characters don't have to face the consequences of their actions or choices, and the author gets out of the corner into which he has painted himself...Well, I expect this is way more than you ever wanted to read, so I'll dry up..."
When Matthias finally dumped me, I formulated my plan: Five books in five years to learn how to write, with the fifth book getting published. And I got busy writing. A sequel to Faded and Changed, about a kid wizard who gets caught with an electronic card counter in Las Vegas and gets offed for it, and his friend and our hero of the previous book turns his rage against the underworld. The FBI, understanding that this guy is on a murderous rampage, then manipulates him into offing the underworld figures of their choice. Pretty fair plot pretty poorly written. Some very good stuff in it. Unpublishable. Decided to do something different, decided to teach myself how to research. Spent a year accumulating the most inane and unusual lists imaginable, my favorite is "Major League Ballplayers Born in the Confederate States of America." Sent it to Matthias, who told me he stayed up all night reading it through, "Couldn't put it down." But he refused to take it on. Never tried to sell it again. I now use it as a source for my other books and articles. 1. Ed 'Pop' Tate, born December 22, 1861 in Richmond, Virginia. Catcher, 1885 Bos N, 6 years. 2. Charlie Ferguson, born April 17, 1863 in Charlottesville, Virginia. Pitcher and outfield, 1884 Phi N, 4 years. In 1886 he was 30-9 and led the league with a 1.98 ERA. 3. Jake Wells, born August 9, 1863 in Memphis, Tennessee. Catcher, 1888 Det N, 2 years. 4. Robert Lee Caruthers, born January 5, 1864 in Memphis, Tennessee. Pitcher and outfield, 1884 StL AA, 10 years. Caruthers was the Confederate State's best baseball player. Led the American Association League twice in wins and shutouts, 40-13 with 6 shutouts in 1885; 40-11 with 7 shutouts in 1889. Stands with the third best ERA in the history of baseball at 2.83. Lifetime 218-99. 5. Ben Sanders, born February 16, 1865 in Carpathen, Virginia. Pitcher and outfield, 1888 Phi N, 5 years. Had a tremendous rookie season, 19-10 with a 1.90 ERA and led the league in shutouts. The fifth book in five years. Seven o'clock on the evening of February 8, 1993 when I got the call all novelists dream about. Laurel Boone offering to publish Dawson up in Canada. Broke all the rules, an American getting published in Canada, without an agent. Basically found a great, unresearched story about the 1905 trip a group of Dawson City, Yukon hockey players made across Canada to play the then best hockey team that had ever been assembled. True story, great story. Good reviews, good reception. Nailed it. "Here at last is the rest of Dawson City Seven, with all my scribbles upon it. It's a terrific book, and a very difficult one. It has all the beauties of good nonfiction, plus all the beauties of good fiction. Getting it into one great parcel is a wrestling match, as you know better than I do. "The designer of the book, Brenda Steeves, wanted me to copy parts of DC7 so she can get a feel for the mood of the book and start working on a cover while you're revising. As I leafed through the manuscript I kept thinking, She has to read This! and This! and This! I've been over it so thorougtly that if I were sick of it I'd have a good excuse. Far from it -- I'm more enthusiastic than ever. "Here are the page proofs for your final going-over. But first, I'll give you your review: the proofreader loved it. He says it's the perfect book -- you laugh, you cry, you're entertained, you learn something new, and you reflect on life. He found it very affecting and moving...and he felt that Billy the Pickle died too soon -- he wished he could have got to know him better. Charles is a tough audience; proofreaders are hard to impress. "...I've come to think that literary fiction differs from mass-market fiction by making some (gentle) demands on the reader. Everything doesn't have to be spelled out, and the reader doesn't always need to be told every step in a sequence. Dawson City Seven has an adventure story at its heart, but it's way more than a simple adventure story. There's wonderful insight in it into human nature, into history, and into the complex connections among an individual, his own history, history in general, and all of these as passed on by the individual. We want to catch the readers up in all this and make them stay caught up, and we can lure them into participating by getting them to do some of the work..."
Goose Lane was the only publisher I could get to even read the manuscript. A year later Laurel asked me, "So Don, what made you choose Goose Lane Editions to publish Dawson?" A book I knew would either be either brilliant or bad. I get it, but no one else who reads it does. It's about a group of characters who take over a novel because they believe the author's inept. Ostensibly a comedic, rambling, off the walls romp, it slowly reveals a problem the writer is desperately attempting to work out within the bounds of his own, hijacked book. I, naturally, think it's brilliant; my editor at Goose Lane Laurel Boone read it and thought enough of it to recommend it to a friend of hers at Milkweed Publishing in Minneapolis. They turned it down, and I promptly gave up on it. Could be rewritten as a straight comedy. Publishable. I looked up the ending page in a notebook, and I saw that I wrote, immediately after finishing the novel, "PST 11:11 PM 3-17-94 Holiday Inn Express, Ontario, California. Is it any good? I honestly don't know. I think so. I hope so." Best book I ever wrote, and I can't get the damn thing published. It is nothing less than the greatest American underdog story of all, about a thirty-year-old mentally retarded man who, in 1911, was told by a fortune teller that he would go east and help the infamous John McGraw and his New York Giants win the pennant, and he did! The man actually pitched in New York's Polo Grounds for the Giants. Nailed this story, too; sat on the Faust family porch at their farm in Marion, Kansas and got the lowdown. Great, great story, many bites, many returns commenting on the great character of Alby Trunk, my fictional narrator, but...so far it is not sold. This book is publishable. Best book I ever wrote. Bob Bernstein told me it's the best book he's ever read. Of course, this statement has to be viewed warily; Ron Lanzoni, my high school football co-captain, once told me that Dawson City Seven was the best book he ever read. After telling me this he paused, then said, "Course, it's the ONLY book I've ever read..."
First of all, back off and remove your various and sundry invading vapors from my space, you might have tuberculars and I don't want them. Second of all, the reason I'm telling this story is I'm the only one in the world qualified and otherwise willing to tell it, because I know it and you don't. I see everything, and though other qualities of mine have vanished or otherwise been abdicated and removed, my various superior qualitites haved been enhanced. I see everything, from inside the heads of strangers and friends and family, to description of lands and towns and places. This is what qualifies me, and also because I possess the screens, allowing me to stop all invading problems which tax our normal systems. Discouraged with a lack of success after the publication of Dawson City Seven in 1993, I decided to return to hockey history. See The "Killing Frank McGee" Companion for the whole story. In a nutshell, an article I wrote on the story is what prompted the books publication. 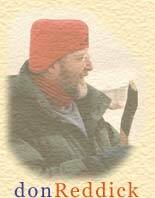 The article, also entitled "Killing Frank McGee" appeared in the 1999 Society for International Hockey Research Journal. It was then bought by Total Hockey to be included in their hockey encyclopedia to be released in the fall, 2000. This article was also selected by Glenn Stout, editor of the Great American Sports Writing series, as a "Notable" for 1999. This all helped convince General Store Publishing House to publish the novel in the fall of 2000. After the publication of Dawson City Seven, I was contacted by a group of senior hockey players in Dawson City and asked to accompany them on their reenactment of the infamous 1905 Dawson to Ottawa trek. In 1997 we traveled by dogsled and ski mobile the 400 miles between Dawson and Whitehorse, bussed to Skagway where we caught a ferry down the Inside Passage to Bellingham, Washington. We then bussed up to Vancouver and traveled by train the length of Canada to Ottawa, where we played a game at the Correl Center against former NHL players. The Trail Less Traveled is a memoir/travelogue/hockey history of the event. Great intimate look at the characters that live in the Yukon today. Will be completed in 2001. Ah, Henry James he wasn't. From a Dickensian childhood on the docks of Oakland emerged an uneducated, racist, alcoholic, opinionated, and arrogant individual. He declared to his first wife on their wedding day that he did not love her, enjoyed the company of prostitutes and derelicts, wrote perhaps the crueliest parental letter of all time to his sixteen-year-old daughter, never paid a bill on time, abandoned his young family for another woman, and ran from every problem he ever faced. I would have loved to have known him. Jack London was woefully unprepared for the overnight fame he achieved at the tender age of twenty-one. The young writer probably would have remained obscure and undistinguished had he not joined the Klondike goldrush. After traveling up the coast and hauling himself across the Chilkoot Pass, London was caught in the freeze-up on an island at the confluence of the Yukon and Stewart Rivers. Huddled inside a cabin with a few others during that winter of 1897-98, he read, depending on which source you quote, Charles Darwin,or Herbert Spencer, or Frederick Nitsche. What we do know is what blossomed in the writer's imagination during the hollow silence of that Yukon winter. In an unintended parody of the common writers' expression, 'write what you know,' London developed his most brilliant, intriguing character: a dog. The Hook: "A group of southern Generals restart the Civil War." The Story: A historically-rooted contemporary thriller turning the all too familiar 'Men are bad, women are dumb' story line on its head. A group of southern Generals spend years closing military bases in the north, encouraging enlistments from the South, then ruthlessly declare the existence of the New Confederate States of America. First woman President of the United States Madison Jenness is confronted with the greatest challenge to an American President since that faced by Abraham Lincoln. In order to assist its defection, the New Confederate States of America encourages every other grudge-wielding nation on earth to settle its own disputes while the worlds last super power is crippled. All the Arab nations invade Israel, North Korea invades South Korea, Argentina invades Chile, China invades Taiwan, India invades Pakistan; major world borders are being redrawn with the assurance that if the New South can win, those borders will be recognized. And in the end, Madison Jenness will indeed show that in this case, the men are dumb, and the women are bad. Bottom Line: High concept, end-of-the-world-as-we-know-it dilemma, saved by the strongest woman character imaginable. The Hook: Two friends, frustrated by personal problems and a life-long distrust of the U.S. government, decide to solve the Kennedy Assassination on their own. The Story: Two regular guys, one obsessed with all things Kennedy, decide that time is running out, that all those left with any relevant information on the assassination are approaching death, and it is time to solve the Kennedy mystery before it's too late. And by the same means that those who allegedly perpetrated it used. By tracing the events of November 22, 1963, these guys track down the remaining survivors, coerce their testimoney to get to the Truth, leaving their telltale clue with each: They are The Zevon Commission. Only when a music-loving FBI agent connects WARREN Zevon with the Warren COMMISSION, do things heat up and become a moral dilemma: "Should I let them solve it?" Bottom Line: High concept, "we'll tell you what really happened" thriller.